But beyond the symbolism and the novelty, does anyone in Europe care? The Lisbon treaty is vague about the process — it directs the European Council to ‘take into account’ the results of the election when it proposes a presidential candidate for the European Commission. But what does that mean? Though polls show that either the EPP or the PES could emerge as the largest bloc in the European Parliament — the closest race between the two blocs since 1999, when the EPP became the largest group in the Parliament — neither will win an absolute majority. Many MEPs have threatened to veto any candidate who isn’t one of the Spitzenkandidaten. But, even assuming that German chancellor Angela Merkel and the other 27 national leaders go along with the scheme, what if neither Juncker nor Schultz can command a majority in the European Parliament? What if neither the EPP nor the PES win a clear victory? Assume that the EPP wins 212 seats and the PES wins 217 seats — is that such a clear mandate for Martin Schulz to become the European Union’s chief executive officer for the next five years? Though Merkel has endorsed Juncker as her preferred candidate, she and other leaders, including European Council president* Herman Van Rompuy have challenged the notion that the Council should necessarily follow the lead of the European parties, and they’ve reserved the Council’s right to put forth its own candidate — even someone who isn’t among the Spitzenkandidaten. It’s a struggle that will play out almost immediately after European election results are announced on May 25. So while Juncker and Schulz probably hold an edge against all other comers in the race to become the next Commission president, there’s no shortage of alternatives that the Council could entertain. The most popular names floated include Jyrki Katainen, the center-right Finnish prime minister who is set to step down in June; Helle Thorning-Schmidt, the social democratic prime minister of Denmark who is rumored to have the support of conservative British prime minister David Cameron, making her a strong compromise candidate; and Christine Lagarde, a former center-right finance minister in France and currently the managing director of the International Monetary Fund, the candidate that The Economist has loudly endorsed. 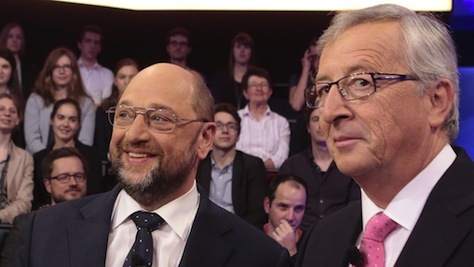 But what goes largely unspoken in the ongoing Commission debate is that both Juncker and Schulz are incredibly dull. Juncker-Schulz might be excused for not rising to the same level of passion as Adams-Jefferson. But their race makes Eisenhower-Stevenson seem exciting. If you wanted to pit the champion of the European right against the champion of the European left, you might expect a fight between the likes of, say, Merkel and former UK Labour prime minister Gordon Brown, not the Juncker-Schulz fight that’s currently on offer. Even at the end of their respective pan-European campaigns, neither Juncker nor Schultz are nearly as well-known throughout the European Union as its key national leaders, including Cameron, Merkel or French president François Hollande. That’s especially true for Schulz, who’s had a much lower profile in both Europe and his native Germany. Both candidates, in their quiet, technocratic way, seem more comfortable in the relatively placid world of European policymaking, which might have made them strong candidates for Commission president in another era. But success in the corridors of Brussels is hardly a prerequisite for winning votes. Among the skills of the next Commission president should be the ability to explain, cogently and compellingly, the benefits of the European Union to everyday European citizens. Neither Juncker nor Schultz have any extraordinary charisma and, while they have their strengths, they’re certainly not barnstormers. They’re so wooden that they make former Belgian prime minister Guy Verhofstadt, the Commission presidential candidate of the third-largest parliamentary bloc, the Alliance of Liberals and Democrats for Europe Party (ALDE), seem like a populist champion of European federalism. They also agree on far more than they disagree. Schulz comes from the German Sozialdemokratische Partei Deutschlands (SPD, Social Democratic Party), which is currently participating in its second ‘grand coalition’ with Merkel’s more conservative Christian Democrats in eight years. Though the two candidate disagree over degrees of policy — e.g., how soon to loosen the austerity budget measures that many national European governments have adopted — the differences between the two hardly amount to a grand debate over Europe’s future. Both are hardy federalists firmly committed to strengthening European integration at a time when anti-European sentiment is on the rise, and the number of eurosceptic MEPs elected in 2014 is expected to double to 100 or more. Juncker served for 18 years as Luxembourg’s prime minister, until last October when his ruling Chrëschtlech Sozial Vollekspartei (CSV, Christian Social People’s Party) suffered a defeat in national elections. Despite his recent rejection by the Luxembourgish electorate, Juncker comes from a long line of national leaders that have transitioned from national to European politics. Juncker’s CSV predecessor, Jacques Santer, served as Commission president himself between 1995 and 1999 as did former center-left Luxembourg prime minister Gaston Thorn, who headed the Commission between 1981 and 1985. Furthermore, Juncker served as the first president of the Eurogroup, the now official committee of finance ministers of the 18 eurozone nations. In that capacity, Juncker was one of the key policymakers as the eurozone tried to deal with the consequences of the 2009-10 sovereign debt crisis. Schulz was the mayor of Würselen, in North Rhine-Westphalia from 1987 to 1998, and he’s been a member of the European Parliament since 1994, and the president of the European Parliament since 2012. * The European Council presidency is yet another office created by the Treaty of Lisbon. Before Van Rompuy’s election in December 2009, it was though that the Council president might become the ‘president of Europe,’ but for the past five years, Van Rompuy’s role has overlapped somewhat with that of the Commission president.